AMETW: The Airtel minutes factory in Africa 3 years on: is it the promised market slayer? The Airtel minutes factory in Africa 3 years on: is it the promised market slayer? Once upon a time the name was Zain; and then Zain stood up to allow India's Bharti Airtel to have a seat at the African mobile table. It is now three years since Airtel entered the market, with something of a fanfare, promising to fully maximise revenues with its minute factory model imported following its success in India. This all came to mind again when a bevy of Airtel heavyweights jetted into Gabon last week headed by Manoj Kholi, Airtel's Managing Director & CEO International, with Tiemoko Coulibaly, CEO Africa Francophone and accompanied by Antoine Pamboro, the Managing Director for Airtel Gabon. They met the Minister for Telecommunications and the President of regulator ARCEP, and during the course of their discussions, said that they were working with the Government to achieve its ICT goals, with the aim of making Gabon the ‘Singapore of Africa’. So has Airtel changed the African market? Is it now a force to be reckoned with? At the takeover, Airtel announced in one of its early analyst briefings that it would not be providing individual country counts for mobile subscribers, and better, henceforth it would be using a 30-day measure of activity (Zain had provided country counts and used the ITU recommended 90-day count). This ensured that historical comparisons would be difficult and so saved Bharti from having to justify lower numbers in the event that its relaunch failed to achieve the expected numbers. 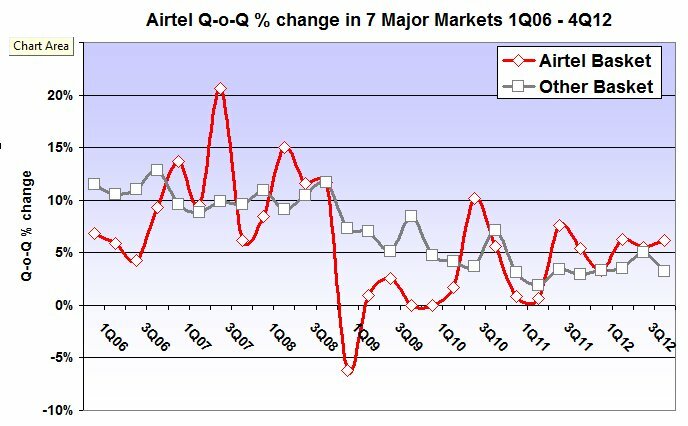 On entry in Spring 2010, Airtel slashed rates in a move designed to win significant market share quickly, and so get its fleet of base stations humming. However, it justified the move by claiming that existing operators were overcharging. This saw revenues across the board drop for all operators affected, leading to calls that such a drop would impact of future network investment. Interestingly, the strategy appeared to fail, Airtel subsequently admitting it has failed to understand its market, as users - having obtained the cheaper calls - used the savings to buy essentials such as food and energy, rather, as Airtel had expected, using them to make longer calls. 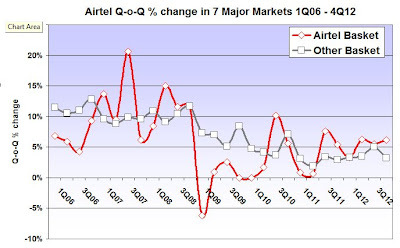 One is reminded of the old line about 'Lies, damned lies, and statistics', and so to ensure a reasonable level playing field, we have looked at the seven markets in which Airtel operates and in which regulators provide data for all operators, so at least ensuring that any distortions are equally applied to all operators. The nations selected were Congo Brazzaville; Ghana; Kenya; Malawi; Nigeria; Rwanda and Tanzania. Nigeria is the largest African market that Airtel operates in with 112.8 million subscribers; Kenya is the second largest with 30.6 million; Tanzania third with 26.2 million and Ghana fourth with 25.6 million. Airtel was compared in each market with a basket of 'other operators'. Looking at the period 1Q 2008 through to 4Q 2012, and remembering that the sale was agreed in Spring 2010, Zain marked the market prettyy well in the seven selected markets from the end of 2006 to mid-2008. 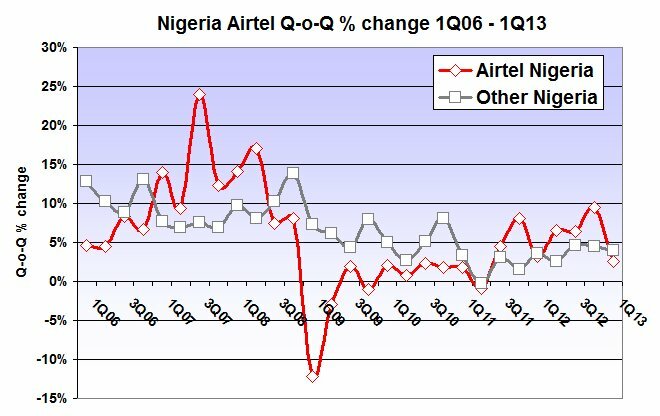 Then, from mid-2008 till Airtel stepped in in mid-2010, Zain's quarter-on-quarter % change fell significantly below that of its competitors. 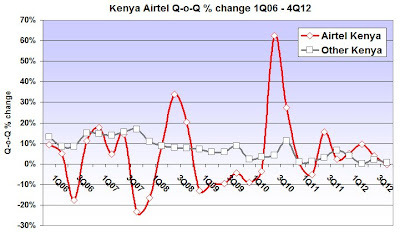 There is a clear growth spurt at takeover, but this soon turns into a dip at the start of 2011, before Airtel showed an improved performance in four of the last six quarters. But the real challenge is in markets like Nigeria or Kenya; in Nigeria because it is the largest African mobile market; and Kenya because it is the second, with a dominant incumbent in the form of Vodafone-sponsored Safaricom. 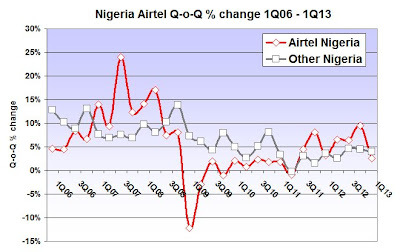 In Nigeria Zain clearly enters a period of decline, before Airtel is able to work its magic throughout 2011 and 2012, outperforming the market as a whole, although it should be noted that the cdma operators were in steady decline during this period. In Kenya, Zain again failed to obtain the traction it needed against a strong incumbent, and at the time of the sale Airtel was able to show significant growth in the first six months of its stewardship. However in 2011 and 2012 it has continued to show a slightly better rate of growth than the market as a whole, but not as such a rate as to touch Safaricom's market dominance. Finally, if the market share at the end of 2010 in the seven Airtel markets studied is compared to the position at the end of 2012, Airtel has raised its market share from 19 percent to 21 percent, and its subscriber base (in the 7 markets studied) from 26.22 million to 43.88 million. 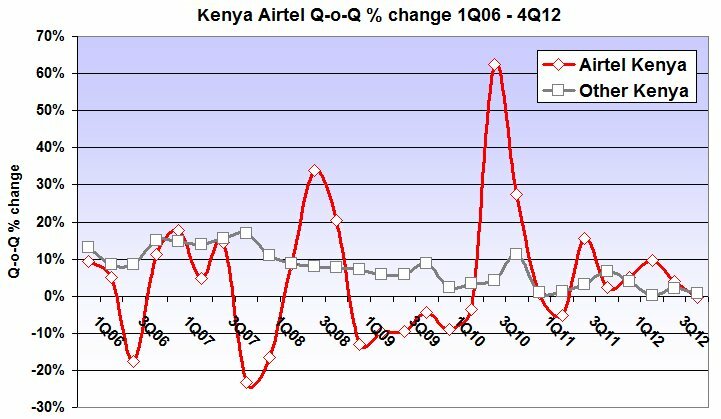 Whilst Airtel made some bold claims when it entered Africa, which have still to be achieved, it would appear from this market analysis that Airtel is making real progress, even if it has found its original minute factory model wanting in the very different climate of Sub-Saharan Africa. For more on Airtel in Africa, check out the free whitepaper 'Airtel in Africa 2012: Key factors & SWOT analysis', and also the free resources available, including a library of Mobile Factbooks and Weekly News Briefings here.